One of the most modern residential buildings in the Paitilla neighborhood, the Pacific Sun and Sky towers are a perfect fit for anybody. who wants to be in heart of Panama City. Walking distance from supermarkets, hotels, restaurants and the “Plaza Balboa”, a beautiful boutique mall packed with lavish restaurants and fashion stores on Balboa Avenue, makes this building a great spot to live in the city. All condos have 2 bedrooms and 2 full-bathrooms along with maids quarters. Unlike other small units in town, apartments at the Pacific Sun and Sky towers are very well distributed and have high-end finishes and appliances. One of the most appealing amenities of this residential building is its rooftop pool with a 360 degrees view of the city and the Panama Bay. Emergency Power Supply for entire building. 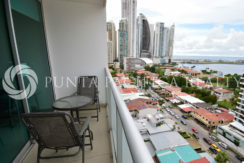 Opportunity Price: Furnished, 2-Bedroom Apartment at Pacific Sky, for Sale!